But people seem to want to talk to the chef, beats me why, so various events have started springing up to make it a more interesting encounter than simply chefs putting diners on the spot at the end of a meal, and vice versa. 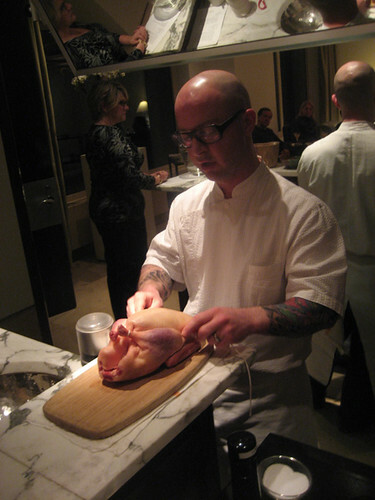 You can go watch Rob Levitt of Mado cut up a pig, say. 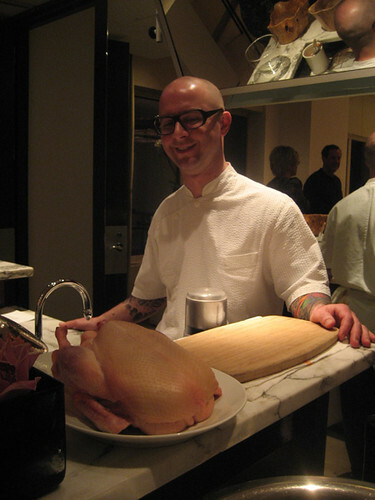 Or, like I did last week, you can go (as a guest of the Park Hyatt hotel, I should point out) to a presentation on the classic French dish canard apicius, featuring NoMI sous chef Christian Ragano and Judy Shertzer of Terra Spice, an Indiana-based spice vendor who supplies NoMI (among others). Canard apicius— basically, in both name and recipe, simply “spiced duck”— is a dish that’s supposed to go back to Roman times, but what it really goes back to for NoMI chef Christophe David is his time at Lucas Carton, which was for many years one of the top Paris restaurants. (It was renamed for owner Alain Senderens for a while, and made more casual, but it appears to be back to the old name— and prices.) I don’t know what he did there, but then again, I guess I do— he was one of many young cooks cranking out the place’s signature dish. As David explained to us at the table, it’s a dish that doesn’t really work in a hotel— it requires prep a few days in advance, then about 45 minutes to roast and serve— so he was clearly glad to have an event which would allow him to serve a dish with personal meaning to an entire table at his restaurant, and perhaps, to stretch the muscles of a staff used to working within the hotel-food genre with some old French restaurant discipline. Sous chef Christian Ragano did the actual presentation; partway through he confessed that this was his first time doing a presentation like this, but he seemed a natural for it, witty and well-organized and making the somewhat daunting process sound like something a regular person could actually do. 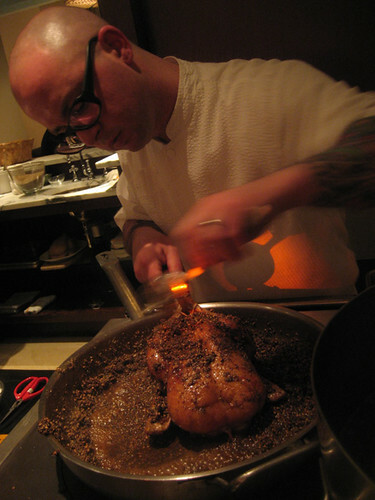 He talked us through blanching the duck (which you may recall from Sky Full of Bacon #2), which is done in a flavorful stock, followed, ideally, by overnight air-drying; then the duck is trussed and roasted partway, the spices are toasted in a pan, and duck meets spices for finishing in the oven. 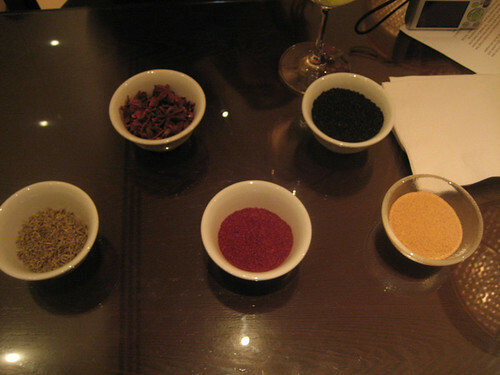 As our small salon filled with the smell of toasted coriander and other spices, we also sniffed and tasted a number of spices laid out in bowls. Any idea what this is? 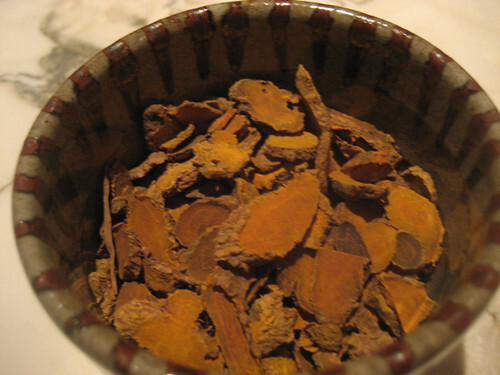 No particular flavor, the only clue is the yellowish cast— it’s whole turmeric, which grows in a ginger-like root. After the presentation we enjoyed a three-course meal in a dining room with the Park Hyatt’s most obvious advantage— a spectacular view looking up Michigan Avenue with the old Water Tower front and center. Banyuls, a sweet fortified wine, is the traditional accompaniment for canard apicius, but in this case for the first course, the duck leg, we were served a Riesling Kabinett, which has some of the sweetness but presumably less than the banyuls. Instead, banyuls figured in the salad’s vinaigrette (and this superbly composed salad nearly stole the show from the duck leg). The second course was the duck breast, served with an apple compote (not that exciting) and a Medjool date puree (brightly flavorful). In both duck courses, the subtle perfuming of the half-roasted bird with the spices kept the strong spices from becoming overbearing, though I did crack off some of the spice coating at times, so as not to chomp whole coriander seeds and the like. We finished with a very pretty dessert served in a kind of snifter, in which raspberry gelatin at the bottom was set off with a slight note of heat and spice from a pink peppercorn cream, the work of dessert chef Frederic Moreau, who calibrated its ratio of comfort to provocation (about 6 to 1, I’d say) ingeniously. I’m so glad I stumbled upon your blog, I’ve been pouring over every word for the last two hours! Was the black garlic used in any of the dishes or just to sample? 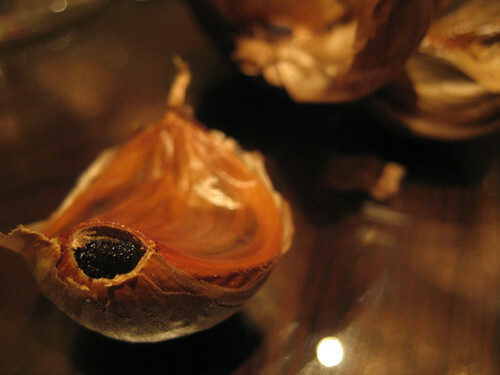 I work for a distributor of black garlic, and I was wondering if I could send you some to try-though I’m sure you have already. No, I think it was one of many things that was just to show off what Terra Spice carries. But I’m always happy to talk samples– email me at mikegebert/gmail.